The Real Agenda received exclusive information regarding the current state of the ongoing emergency in the Gulf of Mexico. The latest assessment performed by the Gulf Rescue Alliance reveals not only that the oil spill is still happening, but also that the Gulf of Mexico’s sea floor grew more unstable since the explosion in 2010. Additionally, analysis provided by experts like BK Lim, shows that the geohazards developed that derive from the rolling leakage of toxic matter, combined with the on-going use of the highly toxic chemical dispersant called Corexit will most likely result in the permanent decline of marine life, while posing out-of-control public health risks, just as it did after the Exxon Valdez spill where the same chemical dispersants were used resulting in a rapid decline of the marine life until, for example, the Herring industry completely collapsed and has never recovered since then. In a letter dated 14 January, 2011 that was sent to Congressman Fred Upton, Chairman House Committee on Energy and Commerce, and Congressman John Shimkus Chairman Subcommittee on Environment and Economy, BK Lim warned the congressmen and their committees about the current state of the sub-seabed in the Gulf of Mexico (GOM). In the document, an in-depth assessment of the emergency was provided. It explains why action must be taken immediately. The evaluation of the emergency in the Gulf conducted by Mr. Lim appears credible and is based on his 30 years of experience analyzing the geologic structure of both dry land and underwater drilling sites for major oil industry companies and leading geohazards contractors such as Fugro Geodetic (M) Sdn Bhd, TL Geohydrographics Sdn Bhd, and RPS Energy Pty Ltd.
“The vaporization of enormous amounts of methane hydrates on a scale not seen before, the release of stresses between the lower and upper crust resulting in the abnormal occurrences of low magnitude, shallow earthquakes adjacent to the New Madrid Fault, the sub-seabed underground erosion in the vicinity of the shelf edge undermining the slope stability with possible tsunami-generating, giant, submarine landslides,” said Mr. Lim. As we now know, the BP explosion that cost the lives of 11 workers was not an accident, but negligence at best and a conspiracy at worst. The latest assessment from the Gulf Rescue Alliance seems to reinforce the fact that BP drilled into the Macondo well with questionable regard for the damage it would cause to the well itself, the sea floor and the marine environment down below. 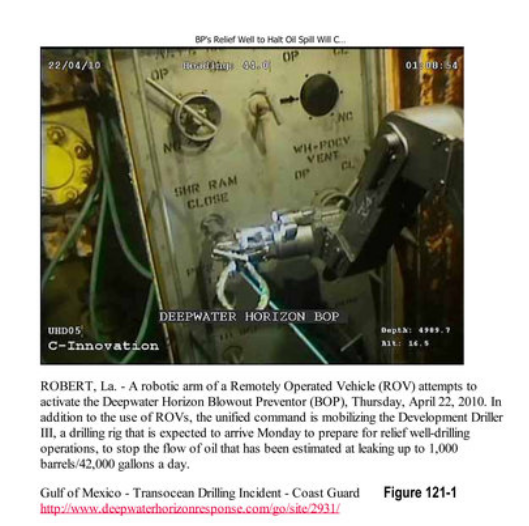 “There is no question that the oil seepages, gas columns, fissures and blowout craters in the seafloor around the Macondo wellhead, observed from the ROV videos, have been the direct result of indiscriminate drilling, grouting, injection of dispersant and other undisclosed recovery activities,” details the document sent to congressman Upton on January 14 of this year. The direct result of the Deepwater Horizon’s explosion was the massive destruction of life through miles of coastline. The less than adequate cleanup, which helped worsen the disaster, condemned the area to living with tons of toxic chemical dispersants that simply destroyed the eco systems and negatively affected the health of thousands of people who live nearby and millions of others who directly and indirectly depend on the fishing, tourism and natural beauty of the marine life, wildlife and environment. A review of the documents and news articles during the days and weeks after the underwater explosion, clearly shows that BP was attempting to buy time with various delay tactics and was unwilling to reveal the truth and magnitude of the disaster. While BP was officially battling to kill well A their contractors and other vessels went about with other covert underwater operations, many of which did not seem to be in sync with the urgency of killing “a third undisclosed well which was gushing even more oil”. For example there was this video showing a ROV brushing of the name of another oil company from a new BOPbrought into the vicinity of the Macondo wells. BP Clean off Co Logo on BOP – why? – on 9 June 2010.Other videos showed oil gushing from craters on the seafloor and ROV activities (blasting (demolition? ), cutting and removal of well casings on the seafloor and from a hole (another well? ), dismantling BOP, grouting of seafloor tens to over hundreds of meters away from well A. How could a BOP be dangling for two weeks from 3 to 16 July while BP was showing to the world’s audience the killing and capping of supposedly the only spewing well A from June till 15 July? In fact, in early media reports animated graphics suggested 3 different leaks locations. BP admitted initially 3 leaks but conveniently reduced to only 1 later; ignoring to explain the “why, when and how”. BP had maintained from the start they had drilled only 1 well. 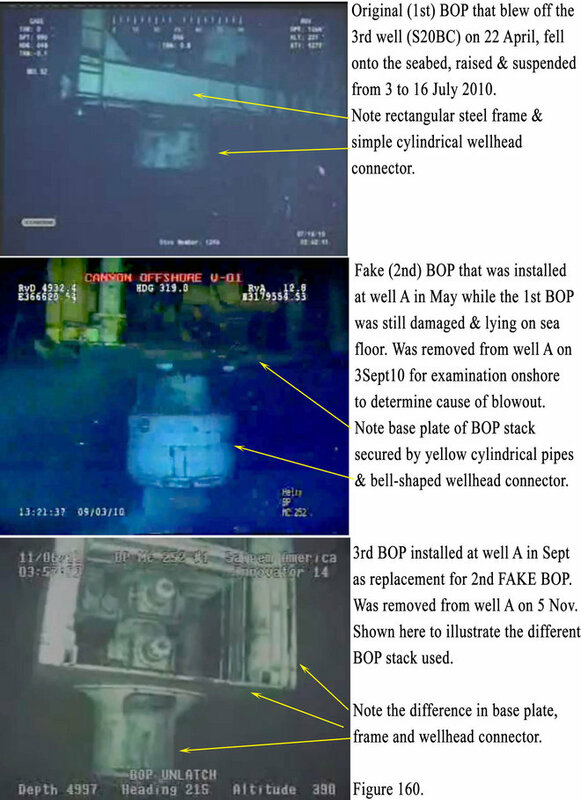 From my analysis in early Aug 2010 I concluded BP could not have drilled only 1 well. They must have drilled 3 wells to account for all the conflicting information. See media reports here. Videos also confirmed that even as early as May to June, oil and gas were already spewing from the seafloor as far as 7 to over 20 miles from Well A. A satellite photo on 25 May suggests a good correlation between the seabed oil spewing and with the faults and Salt Domes. Evidently, numerous Youtube video postings not only confirm that BP and multiple federal agencies who were on the scene were not revealing all to the public, but that unknown quantities of hydrocarbons were still leaking out from the reservoir at high pressure and seeping through multiple fault lines to the seabed. “It is not possible to “cap” this oil,” reads Mr. Lim’s analysis. “Until a solution is found to seal these fissures, the hydrocarbons, including Hydrogen Sulfide (H2S), will continue to leak uncontrollably”. WHAT IS NOW HAPPENING BELOW THE GULF’S WATERS? The document sent to congressman Fred Upton is accompanied by photos, videos and other documentation that support the concerns expressed by the Gulf Rescue Alliance. Just as a doctor with years of experience in viewing and analyzing x-rays can immediately see a fractured bone or other ailment when a laymen would not see it or understand it’s importance, Lim has years of experience in viewing underwater videos of oil and gas seepage and can quickly see and analyze what is occurring where a laymen would not pick up on it. In his letter, Lim describes what is occurring in a series of underwater videos taken by ROV’s around and near the wellhead. In one of the videos, Well A, as it is known, appears to be releasing clouds of methane saturated seawater, gas bubbles of methane and re-crystallized methane crystals floating close to the seabed in the vicinity of the Macondo wellhead. On top of this, says the letter, it is also possible to see new fissures and a bulging seabed developing together with an already blown crater. A second video shows how the very rope that guides the surveying ROV disappears into a dense, darkish cloud of oily fluid. Lim’s document explains how grout materials and old drilling mud that were previously taken to higher altitudes by columns of gas in the water can be seen in the video falling back onto the sea floor. These columns of gas are coming from newly activated venting fissures formed due to sea floor instability and fragility. Viewers can also see re-crystallized methane which appears as transparent and light multicolor materials floating in the water. The third video shows the “periodic expulsion of the gas through one of the fissures on the seabed. Like geysers, the escaping gas needs to accumulate beneath the top sediment cover until the built-up pressure exceeds the combined water-column and overburden pressure just before each periodic expulsion,” explains the report compiled by the Alliance. According to images obtained from a ROV video, there are pools of tar/oil sediment all over the seafloor which are the direct result of the oil spill. Although it is very difficult, under the current circumstances, to obtain clear footage of what is going on at that depth, my extensive training and experience in analyzing these types of situations, combined with these footages and others which I have access to, provides proof that oil and gas are still seeping unabated from the uncontrolled leaking reservoir,” warns BK Lim on his letter sent to congressmen Upton and Shimkus on 14 January, 2011. Independently collected video footage from places like Saint Louis Bay Beach, Pensacola Beach, Santa Rosa Beach, Bon Secour National Wildlife Refuge and other places around the Gulf shows large amounts of fresh Corexit foam on the beach. As Corexit can only be used to sink fresh oil within the first couple of days of it coming up out of the ground, it is yet another indicator that there is an on-going attempt to sink fresh oil below the surface. Surficial bitumen layers (oil tarballs) that made it to the water surface as recently as September 6, due to storm surge are also coming up in massive amounts. According to sources close to the Gulf Rescue Alliance, on August 18, 2011, members of EcoRigs, went out and collected surface water samples that contained crude oil which they believed belonged to the ongoing BP oil spill. They also recorded video evidence of a heavy oil slick on Long Beach Mississippi. The water / oil samples were examined by independent laboratories and the first of those samples to return from the lab on the 28th of September confirmed their concerns: the oil was BP’s and from the Macondo reservoir. Water sample analysis conducted independently by EcoRigs shows a positive correlation to BP’s oil spill samples. “The presence of fresh BP MC 252 crude oil in surface waters 2 to 14 months after the well was reported to have been capped suggests that crude oil from the BP DWH MC 252 field may have found new pathways to the seafloor.” The evaluations conducted also reveal that the toxic chemical Corexit is now being applied to the subsurface leak located 1500 meters beneath the ocean’s surface at the wellhead. This is done with the intention of further decomposing the oil so that the smaller particles do not make it to the surface and the continuing oil spill can be easily kept from the public eye. “A seafloor survey then (within the first few months) would reveal the ugly truths about the broken seafloor and precarious salt formation they were trying so hard to hide,” continued Mr. Lim. After more than a year of grouting, patching up and destroying all critical evidence in the seabed around the Macondo wells they (BP) were confident enough, the “modified seafloor” would not be incriminating to them. According to Mr. Lim, British Petroleum was very careful not to mention the fact they had drilled 3 wells. If this fact had come out, it would have caused a bomb and they could have been indicted for drilling without permission. “That is what they fear most,” says Lim. BP was also careful to isolate drilling crews away from each other, which according to Lim, is against safety rules because drilling need to be briefed on hazardous and technical problems encountered at earlier drilling stages. Although BP may not have expected the three wells to blow up, this was an almost sure outcome due to the interconnected shallow gas formation (which was one of the main causes of their numerous problems). Further, after urgent requests for recommendations, a formal request was made to the Coast Guard on behalf of Constituent David Fakouri with the Louisiana Economic Foundation demanding seafloor survey and damage assessment be done with a 3rd party observer, but the request was denied. “The vessel’s track history seemed to suggest higher emphasis in the south-western edges of the Biloxi Dome, the southern edged of Whiting Dome and generally south of the Macondo prospects. While there may yet be geologically valid reasons for the emphasis south of the Macondo wells, the shelf edges 6 to 8 km north-west of Macondo Wells and the badly eroded north-western edges of Whiting Dome should at least be surveyed with some grid-lines (see areas P1 and P2). BP’s vessels had been observed working for quite some time in both areas. The 22 mile long underwater plume (first denied by BP and later confirmed by many independent research cruises), was suspected to have originated from the cracks in the seafloor at these locations. By avoiding these critical areas, can the present survey investigation be truly objective and independent in investigating the truth of the Macondo Blowout? During the first few weeks of the disaster, there was a struggle within BP between thosewho wanted to come clean about the reality of the situation and another group that wanted to cover it up. Apparently the latter group managed to win the struggle and they decided to use the well with the least of the problems (the first and shallowest, Well A, which was drilled to about 5,000 feet below mudline) to be the one staged for the world media as the “show capping” of an oil spill. The third and bigger leak at Well 3, which the late Matt Simmons kept asserting was “the deepest well that reached the Macondo oil resevoir”, was kept out of the public limelight. A confidential source informed The Real Agenda that credible scientific evidence has been gathered giving high probability to allegations that oil is, in fact, still leaking and that inadequate oil spill response protocols were employed by the EPA, Coast Guard and other officials at Federal and State levels throughout the disaster. According to the source, the compilation of the scientific evidence is not just an edict of worrisome errors but criminal negligence resulting in a worsened tragedy throughout the Gulf States and Gulf of Mexico Ecosystem resulting in serious human health consequences—with EPA being at the head of that mismanagement. The source further reports that between May 2010 and March 2011 long after the reported capping of the BP well in July of 2010 the average toxicity levels in the Gulf Region waters from Texas to Florida were persisting at unsafe levels and that, in some cases, they were thousands of times higher than EPA established safety threshold levels. It was during this same period of time that federal government agencies put out propaganda saying everything on the Gulf of Mexico was safe, including seafood, air and sea water. It has been alleged that NOAA’s testing methods were flawed resulting in the “all is safe now in the Gulf” proclamation by responsible agencies. A separate concern is the fact that BP has a $500 million fund paying for continuing studies on the after effects of the spill and use of Corexit leading to concerns by independent scientists over the transparency and availability of this information to the public. Scientists under BP or government contracts conducting studies are not permitted to publicize or discuss any of their data until delivered to their employers. With some of these studies estimated to take several years, the public won’t know the truth until years later. On September 13, 2011 new oil was seen close to where the original BP oil explosion occurred. Due to the fact the EPA insists on using Corexit as the only possible solution to the problem, the most important issue up to this point -the dire consequences of using Corexit- are not being addressed. Corexit not only contaminates the Gulf of Mexico and the human populations established throughout, but also is ineffective remediating the core problem: cleaning the Gulf waters as fast as possible. The only thing Corexit has proven is its effectiveness to pollute the waters and the Gulf as a whole. Why then does the EPA and the federal government insist on using it? It is interesting to note that none of the official statements by either the EPA or the oil companies state that Corexit cleans up the waters. They do, however, repeatedly state that Corexit is “effective”, which misleads the public into thinking that Corexit is cleaning up the waters. What Corexit is effective at is sinking it below the surface where it is difficult to see and quantify just how much is there, and breaking it up into small particles and spreading the contamination far and wide making the potential problems of toxic exposure to both humans and all the flora and fauna exponentially worse. On its website, the EPA mildly agrees that using Corexit as a tool to clean the Gulf has “trade offs”. The question is, where are the positives? The oil is not being cleaned, but the waters and the complete ecosystem are being contaminated. Given the Federal Government’s line of action, it seems the task at hand is to make things worse, instead of better. Even after BP requested to test on the DWH oil already-proven, effective, non-toxic alternative oil spill cleanup technologies the EPA refused to allow those alternative technologies to be utilized. One of the most highly regarded products suggested by scientists and environmental and conservation groups is Oil Spill Eater II, which is not only approved by the EPA, but also listed as part of an official list of products for oil spill cleanup, called the National Contingency Plan (or NCP List) that have been tested and approved as workable for emergencies like the one now taking place in the Gulf of Mexico. According to the Gulf Rescue Alliance, BP’s requests to use Oil Spill Eater II were denied by the EPA and regional federally controlled response team officials. The Real Agenda additionally received documents showing formal requests were made by the Governor of Louisiana Mississippi and Alabama to use or conduct trials on OSE II in their states. In June 2010, the EPA sent a letter to Louisiana Governor Jindal denying the use of bioremediation methods for the DWH oil. Per documents obtained by the Gulf Rescue Alliance, the letter had a number of inaccuracies and misleading statements in it, and showed a surprising lack of understanding of the natural process that mother nature follows to clean up an oil spill. This effectively took off the table all but one of the non-toxic products on the NCP list for use in the Gulf of Mexico blowout. The only non-toxic product which did not fit under the detailed description of why the EPA stated that bioremediation would have only limited value, unwittingly made the case for the immediate use of OSE II. When this was pointed out to the EPA in a subsequent letter by OSEI, the company that manufactures and distributes OSE II, the EPA ignored the letter. BP America’s Chief Counsel stated in a conference call with the OSEI Corporation, in September of 2011 that BP was not able to use OSE II to treat the oil disaster because “BP is bound by the government’s decision” —bound by the EPA mandate [to keep using Corexit]. Consequently, it is estimated by sources outside of BP that BP could “have saved an estimated $36 billion in clean up costs if they had deployed the EPA approved alternative to Corexit. Gulf Rescue Alliance members state that it is in possession of voluminous documentation that indicates the EPA arbitrarily blocks any attempt to use environmentally friendly methods to clean the Gulf and instead prefers to use Corexit with no regard for the marine life and public’s health from the now proven to be fatally toxic chemical dispersant. The use of friendlier technologies could not have only saved the Gulf’s ecosystem in the earlier stages of the disaster, but it would have also reduced the costs of the clean-up process for both the federal government and BP itself and prevented untold damage. Instead, the disaster in the Gulf continues to endanger everything and everyone as the toxic contamination spreads, and the costs of the clean-up process -which are now estimated in the tens of billions of dollars- continue to skyrocket. Given the EPA’s decision not to help resolve the oil spill disaster in the Gulf of Mexico, community organizations such as the Surfrider Foundation and the Center for Biological Diversity have filed lawsuitsthat ask the EPA to conduct long-term studies that evaluate the impacts of Corexit on the environment and endangered species. It is expected that these lawsuits will act as a wake-up call to the EPA, NOAA and the U.S. Coast Guard, which appear to have made a conscious effort to block all alternatives directed towards the use of OSE II or any other environmentally friendly and truly effective technologies or techniques to clean the Gulf swiftly and effectively. Luis R. Miranda is a Journalist with 15 years of experience. He is the founder and editor of The Real Agenda. Learn more about Luis here. Pingback: Random Thoughts » Deepwater Horizon spill continues.